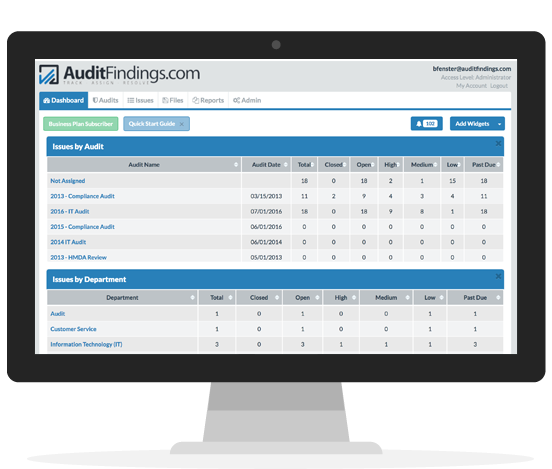 With AuditFindings, any business can implement a robust tool for tracking audit issues. The web-based tool for audit issues tracking is easy-to-use and eliminates the pitfalls of using spreadsheets. With centralized management, all audit issues are easily managed from a central location. With database driven reports, you can get complex information in an easy to understand format. With social commenting, multiple users can discuss and share ideas on resolution options. Minimize time needed to notify and remind people to update status of uncorrected or outstanding audit items. Upload supporting documents, such as the actual audit report or findings. Still use spreadsheets? Import and export to Microsoft Excel or PDF. With tagging, you can flag specific issue for custom reporting. No software to install or maintain. With web-based access your information is easily accessible by your team. The dashboard provides ready access to key information related to the status of audit issues. Assign issues to specific personnel for corrective action. AuditFindings provides a simple solution to a difficult problem of managing audit issue.